I stamped the flowers on watercolor paper, then mixed some distress inks to get as close as I could to the flower colors in the header. I'd have liked them to be a bit more pale in color, but overall , I think it's a good representation of it's inspiration. Hope this little bouquet of pansies makes you smile. Here in Florida we have a week of 80 degrees, with beautiful blue skies, white puffy clouds, and abundant sunshine. My DH went into the pool today for the first time and he pronounced it "refreshing". Life is good! Thank you for visiting today - I appreciate your sweet comments so much. 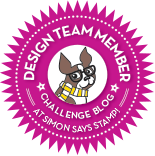 And since I used so many patterned papers, I'll also enter my card into the Simon Says Stamp Challenge: 3 Papers. 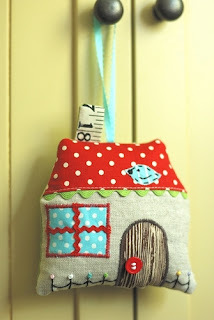 Over at Moxie Fab World, Cath has set us a new challenge to use the up and coming navy blue. 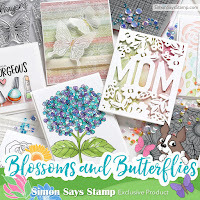 Several of her photo inspirations made me think of this new Hero Arts background stamp called Leaf and Floral Background. Then I remembered thinking when I first saw it that this medallion from an older set would be a good match for it. So here was my chance to try their pairing. What do you think? 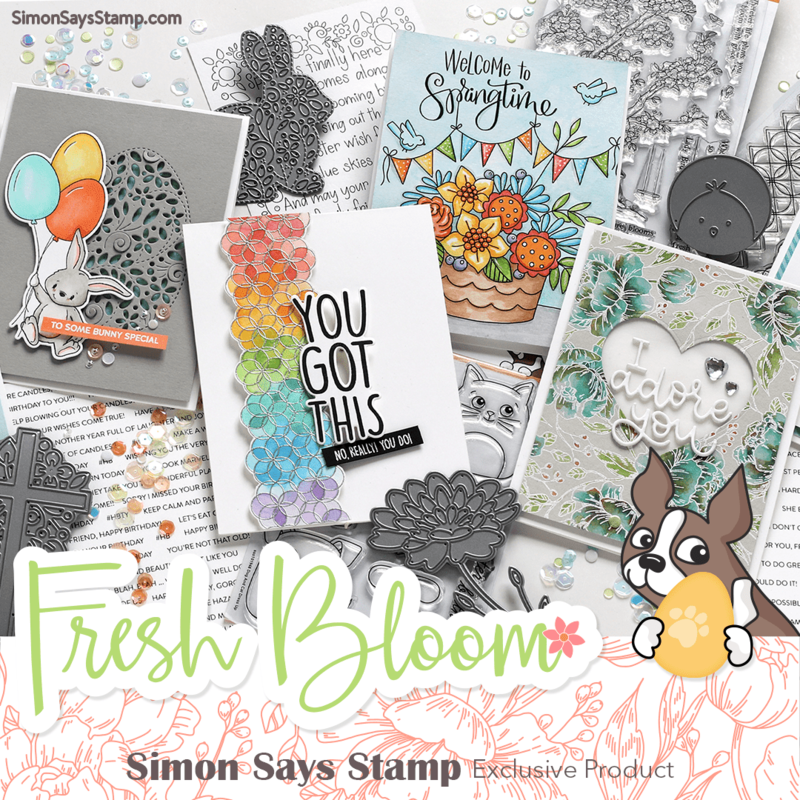 We're sponsored again by Simon Says Stamp, so give this technique a try and share it with us at Lily Pad Cards to win a gift certificate! Pink, brown and cream makes a beautiful combination! 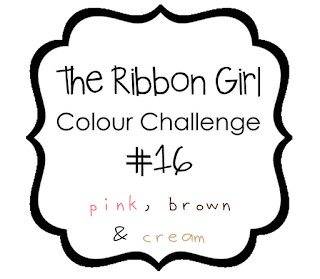 And amazingly, pink and brown are the required colors for the challenge over at the Really Reasonable Ribbon challenge, too! It's very strange to make a card and not do any stamping, but these papers didn't need anything else; even the sentiment was already there! I cut the card narrower to accomodate the scalloped edge and balanced it with the beautiful ivory lace. 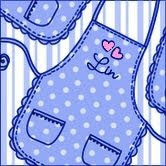 It's time for another Virginia's View at Lily Pad Cards! This week we're sponsored by the Sweet Stamp Shop, and each of us was given some sample stamps. 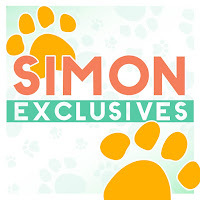 Here's what I did with mine, part of a set called "Melvin and Vernie"
Be sure to visit Lily Pad Cards to see what my other teamies did this week; there's also a sketch to use, if you 'd like. 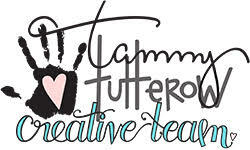 You could win a $25.00 gift certificate to Sweet Stamp Shop!! I love the Play Date Cafe's challenges when we do "Black and White with a Splash"! 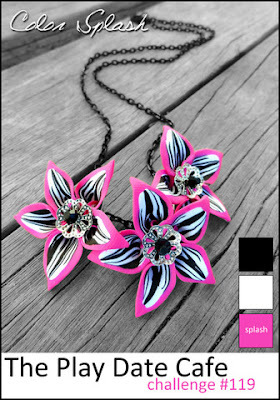 This time the splash is hot pink. Here's my entry, using this gorgeous new background stamp by Hero Arts - love the script detail! 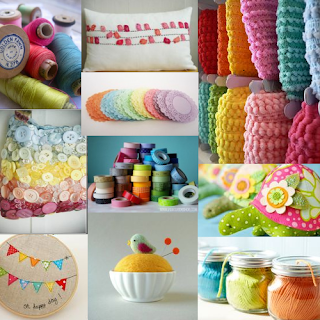 There's a sketch challenge at the Ribbon Carousel Challenge, and the prize this week is from The Craft's Meow! 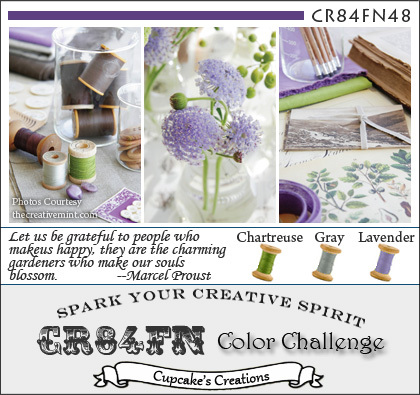 The new challenge at CR84FN includes these colors plus chartreuse........here's the photo inspiration, really lovely, isn't it? 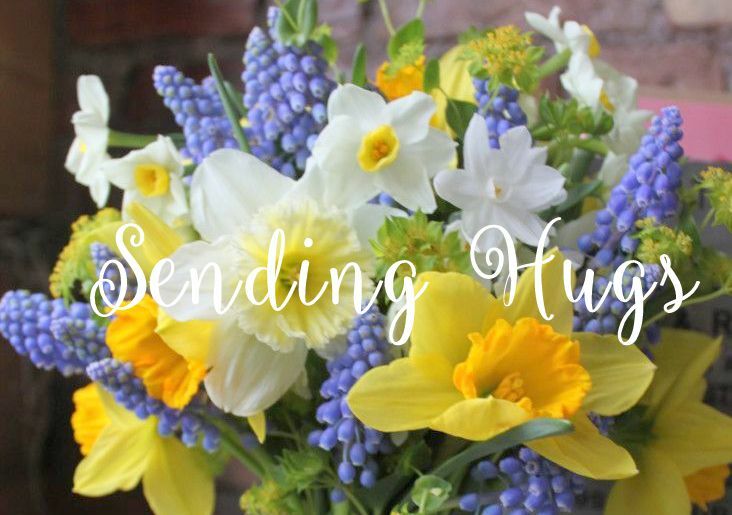 Here's my card for all of my wonderful blog friends out there! To me, Valentine's Day is the day for letting my family and friends know how much I appreciate them. Hope you pass these feelings along to those who mean something to you, also. Wishing you lots of Valentines!! 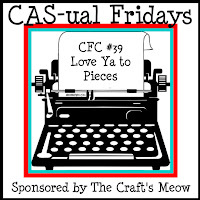 This week at CAS-ual Fridays we are to make a card using paper-piecing. Also skidding in at the last minute to enter the Moxie Fab World's Cool Tool's Die Cutting Challenge. Here's my take on it. I kept my card at an A2 size, but followed her recipe pretty much everywhere else. As some of my Hero Hostess Sistas have been doing, I'd like to share a card I made to submit to the recent Paper Craft Magazine Stamp It! Vol 9 submission call. I really liked this card, but it didn't work for them this time. The flower is part of a big background stamp that is fairly new to Hero Arts, called Large Flower Background, stamped on watercolor paper, then painted in using diluted distress inks, with a little marker to shade it. This fits nicely into the Our Creative Corner challenge this week:"Best Friends", to make a card for a friend which includes a flower. I've been neglecting my favorite challenges, but now I have the time to play again. 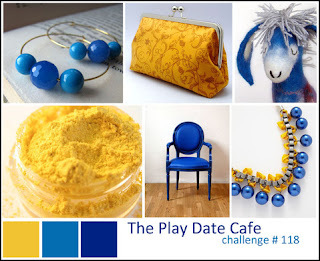 Here are the happy colors that the Play Date Cafe has chosen for us this week! This also works in the die-cuts and Friends themes at the Hero Arts monthly challenge. 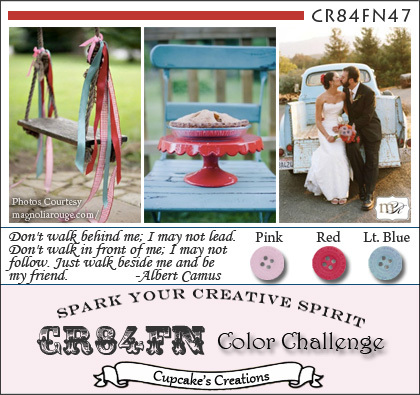 At the Flourishes blog, yesterday's noontime challenge was to make a card based on a photo inspiration. 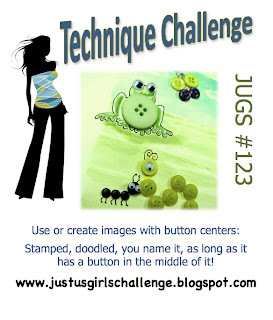 And I'm adding this to Moxie Fab World's Cool Tool's Week Die Cutting challenge. I made this card for the challenge at Hero Arts for February. 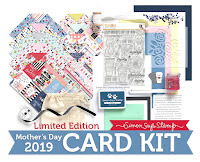 There are lots of categories to choose from : Friendship or Hello cards, using die-cuts, or following one of 3 sketches. My card was entirely influenced by the brads I just bought, which are a springy green, a dusty blue, and chocolate brown. I used 2 new stamps and one of my favorites from last year, the 3 Dotted Flowers. Violets and pansies have lots of sentimental meaning to me, so this was a must-have set when it first appeared - even the sentiment in this set is a lovely one! I can finally play at the My Mind's Eye monthly challenge, now that I'm getting some My Mind's Eye paperpads - thank you Archivers and Hobby Lobby! We're following a sketch, see below - here's my entry, using some papers from the new Be Happy pad and some older ones,and some matching brads. I LOVE that the papers coordinate from one collection to another!! 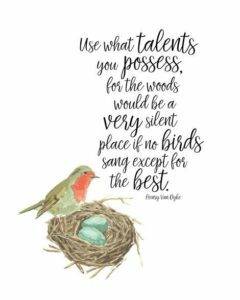 Just sharing a card I made for the Blog Blitz over at Outside the Box blog. We are to make a card and use at least 1 Memory Box stamp or die. I don't have any of my stamps here with me, but I did order this amazing little Perched Reed Bird die after taking the Clean and Simple class online. And I have some beautiful Memory Box papers here too, so this is what I came up with. Julie Ebersole used this idea of the negative image of the die in the left corner, popping the design paper panel above it. This fits into the Moxie Fab World's Cool Tool's Week: Die Cutting Challenge, too, so I'm entering it there. Hi! 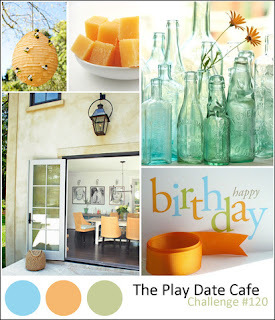 Today is another one of our color challenges at Lily Pad Cards! The fun thing about a digital image is that you can make it any size you want! 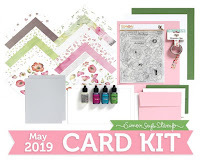 Go on over to Lily Pad Cards - I can't wait for you to see what all the other DTs did with these fun colors - I know you'll be wowed!